In recent years, libraries often use Blog as a tool for news release, reading promotion, library resources introduction, reference service, etc, to communicate with readers. This study analyzed “NTU Library Reference Service Blog” by Google Analytics, which is a well-known web metrics tool. The purposes of the study are: to understand the usage of the blog and to evaluate the actual effectiveness of the blog. The results of the research provided valuable reference for future improvement of the blog. In this work, based on related researches of user interface design and usability evaluation in food blogs, we first develop a usability evaluation model, incorporating three perspectives: content usability, interactive interface, and layout design, with 21 evaluation items in total. The 15 evaluation samples are chosen from three types of food blogs: personal food blogs, company food blogs, and Alexa food blogs. This investigation proposes several important findings. Firstly, in each of these three types of food blogs, the most famous blog is better designed than those randomly selected blogs. Secondly, Alexa food blogs are overall performed better than the other two types of food blogs. In addition, personal food blogs are scored more or less equal to company food blogs. From the perspective of each individual evaluated item, all three types of blogs have severe usability problems in two items: improper use images and website blocks. In addition, personal food blogs have severe usability problems in five other items: consistency, navigable age length, stable connection, consistent theme, and individual article cumulative popularity. Company food blogs have severe usability problems in two other items: consistency and opinionated blogger articles. Alexa food blogs have severe usability problem in only one more item: article classification. Since the 1980s, the Taiwan government started to develop the E-government, with websites constructed to diffuse resources. Meanwhile, the rise of consumer awareness has led to the growth of consumer-oriented websites, providing information of medicine and health and resulting in wide discussions on health-related issues. Therefore, this research adopted the content analysis method to analyze the consumer health information from 62 websites of government agencies of health and welfare. The study employed a systematic approach to exploring the status of consumer health information, characteristics, website contents and provided services. In summary, this study proposed the following findings. First, the developers of the websites include government agencies, non-profit organizations, and non-government organizations. Second, most of the websites fall into the “healthcare industry” category. Third, the major type of information provided is “news”. Fourth, the main contents are about health promotion. Fifth, most of the websites are for everyday users. Sixth, the websites mainly provide “information delivery” services. Seventh, most of the websites are information- and-resource-based for policy promotions. collected items. This negligence thus prevents the researchers from further understanding the contexts of how books are classified. This essay looks into the contextual framework of original management of private book collections by sorting out related literature and analyzing the management models. Consequently, the research also provides certain inquiries and recommendations for the collecting institutes. 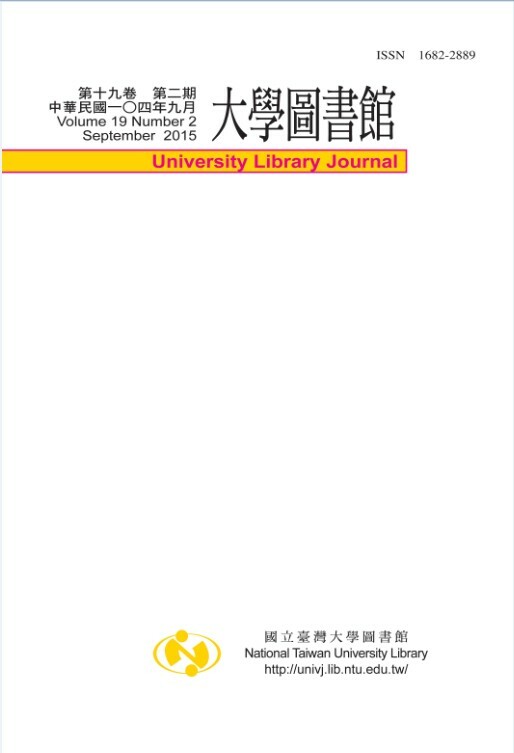 The instruments used in the study was the National Chiao Tung University Library E-book Reader Lending Service Use Survey. This study was based on UTAUT (Unified Theory of Acceptance and Use of Technology), and students at National Chiao Tung University were chosen as the testing participants. The purpose of this study was to investigate reader’s behavior, intention and determinants toward e-book reader lending service. The findings of the study were as follows: 1.Most readers have difficulty with reading e-books because of eyestrain and lack of content; 2. 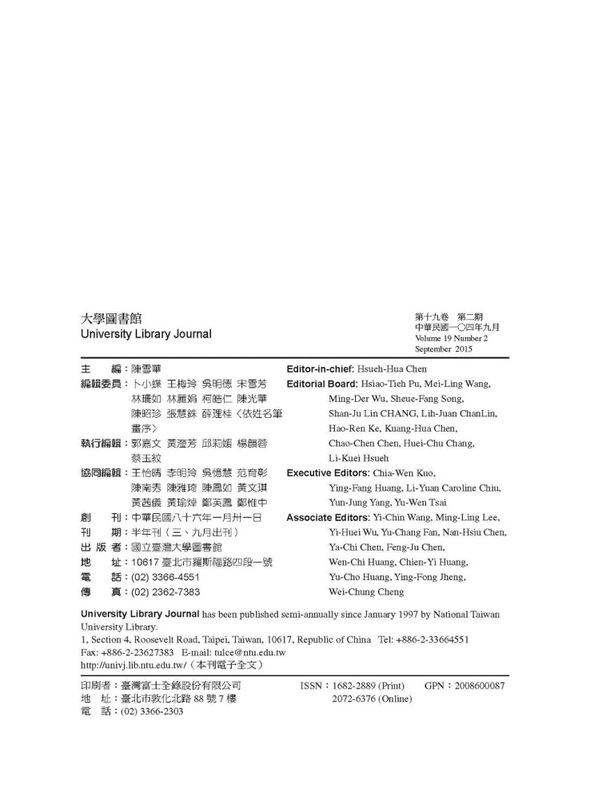 Most readers are willing to use e-book reader lending service; 3.The determinants of intention to use e-book reader lending service among students at National Chiao Tung University include performance expectancy, effort expectancy, and social influence. According to the findings above, this study provided some suggestions for libraries to promote the service and suggestions for future research.